Whether you a are local or just visiting Federal Hill, the Mad River Bar & Grille should certainly be on your list of favorites to check out. Great local ..
Federall HIll restaurants, bars & night clubs make Federal Hill in Baltimore one of the most vibrant neighborhoods in Baltimore. The neighborhood is not only an entertainment district but one of the best places to live in Maryland. 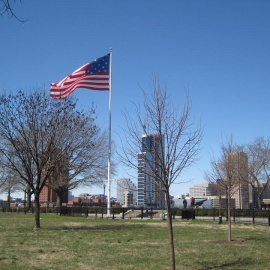 Federal Hill is located in South Baltimore and is only a ten minute walk to Downtown Baltimore & the Inner Harbor. Baltimore Orioles park at Camden Yards, Baltimore Ravens Football stadium, MARC train to Washington DC, and the light rail are also all within walking distance. The Federal Hill neighborhood is a federal historic district with a strong community sense of perserving their individualism. The area is comprised of many 19 century homes that have been rehabbed in the past 15-20 years. Not only does this neighborhood contain a great deal of history but also stirps of restaruants, shops, and nighlife full of bars and clubs span the streets. If you are looking for restaurants in Federal Hill Baltimore, you will find a variety including seafood, fine dining & ethnic restaurants. If it is the Federal Hill nightlife that has your attention, you won't be disappointed because the bars in this neighborhood will suit any craving for late night entertainment.